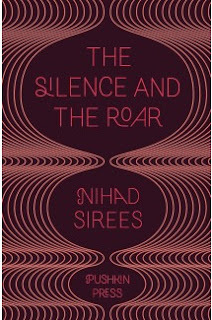 The Silence and the Roar is a day in the life novel following Fathi Sheen, a writer no longer permitted to write, in an unnamed Middle Eastern country, ruled by a dictator known only as the Leader. The day is hot, and the streets are packed with people marching in celebration of the Leader. Fathi's only desires are to visit his mother and his lover, but as the day goes on, it becomes evident that the regime has other plans for him. This novel was brought to my attention by English Pen as one of their award winners for works in translation. I decided to buy it, having heard it favourably compared to the best of Milan Kundera (one of my favourite authors). I can see where this comparison comes from. Fathi is a writer who isn't writing, spiraling further into 'unhappiness and self-loathing' (10). He therefore has a lot of time to philosophize on the regime, considering thinkers such as Hannah Arendt and Aristotle, in the process. Like Kundera, Sirees provides his readers with a highly self-conscious, intellectual protagonist. For a novel which deals so directly with the realities of living under a totalitarian regime, it is surprisingly amusing. Whether it is Fathi's worryingly carefree mother, or his complete inability to take the heavies of the regime seriously, humour is at the heart of Sirees' writing. All Fathi can think to respond is "Surrealism". One cannot help but think of Kafka's The Trial when confronted with this answer. And like in The Trial, Fathi is exposed to treatment that becomes more and more nonsensical. His ID card is confiscated for no reason, he discovers his mother is about to marry one of the Leader's right hand men, and he is confronted with a final and terrible ultimatum: he must work for the Leader and join the roar of the propaganda machine, or face the silence of the grave. The writing is atmospheric and visceral and this is a compelling translation of a novel which strikes a definite chord with a contemporary reader. While The Silence and the Roar is a story about censorship and oppression, it is also about the resourcefulness of human beings; even under the most difficult of circumstances, it is possible to find strength through love and laughter. You've been busy blogging and reading lately! And I know you're a busy bee outside of that too. Wilson - you're a grafter! PS Sounds like a good quality read. Yeah, helps keep me sane! This really is a good book. You can borrow it if you like; it's not that long.